Create some night magic with a PDC Spa. Soak all the day's cares away. Isn't it time you added a PDC spa to your lifestyle? We are the Pittsburgh area’s number one source for fiberglass tub and shower repair, swimming pool step repair, and steam shower repair. Iovino Tub & Spa has been a family owned and operated retail and service business since 1988. We take great pride in our work and our client list has grown over the years based on customer loyalty and referral. Our service office and retail store is located in the Penn Township, Harrison City area in Westmoreland County. We are located just 8 miles from either Greensburg, PA or Monroeville, PA. Our service technicians drive within a 100 mile radius of the Pittsburgh and Greensburg area. Our goal has always been to ensure the complete satisfaction of every customer while offering knowledgeable and friendly service at competitive rates. We know that you’ll feel confident in our ability to meet all of your expectations and know that our customers are always our number one priority. We are the acrylic bath tub specialists. 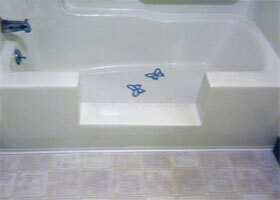 Do you want a shower conversion for your existing bath tub, or do you need a surface repair? We work on bath tubs, whirlpools and steam showers. Call us today! Looking for a new hot tub? We have you covered. Iovino Tub & Spa is an honest, family owned business that has been selling spas for over 19 years! 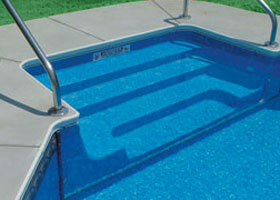 We Repair and Refinish In-ground Pool Steps! Over time pool steps can weaken and crack if there is insufficient support below the step. We reinforce under the step, repair the fiberglass surface, and repaint the entire step so that your cracked steps look good as new!